An ensemble of young musicians beat wooden sticks against empty plastic jugs, rattle old bottle caps, shake rice-filled containers and chime metal plates to compose an energizing percussion that reverberates through the humble nook and into the surrounding neighborhood. These instruments, more commonly employed to brew liquor, are being used to orchestrate a symbolic and creative expression of the changes taking place in one of Ahmedabad’s most neglected communities. In 1998, Dr. Ganesh Devy and Mahasweta Devi, two well-respected social activists and scholars, visited Chharanagar and asked the residents what they needed for development. The locals asked for books, explaining that education alone would liberate them. This led Dr. Devy and Mahasweta Devi to establish Budhan Theater and pass its ownership onto some of the community's young adults such as Daxin Bajrange, Roxy Gagdekar and Kalpana Gagdekar. What started as a public library soon propelled into a movement led by the Chhara community. Budhan Theatre tapped their latent talents and the medium of theater to represent the sixty million Indians who have been branded as born criminals. Soon after the Revolt of 1857, the British Government of India passed the Criminal Tribes Act of 1871, which notified 192 tribes as having criminal tendencies. These groups included cattle grazers, bards, acrobats and other nomadic clans whom the British government suspected of spying and channeling information between rebels and freedom fighters. Several of these tribes had also been among those who resisted British aggression and expansion. Furthermore, since these individuals were landless, they did not contribute to the tax revenue system. Between 1871 and 1944 the Act was continuously amended. The Act justified restrictions on the movements of these people and led to the establishment of open settlements, where they were forced to live in labor camps as an effort by the government to rehabilitate them. The men were pushed to work in local factories and mills, while children were separated from their mothers to discourage the inheritance of criminal behavior. After independence, the Government of India declared the Criminal Tribes Act unconstitutional and replaced it with the strikingly similar Habitual Offender’s Act of 1952, which accomplished little more than providing the tribes with the new label “denotified”. These denotified tribes (DNTs) were released from the open settlements, but they were not freed from the stigmas associated with them. Today nearly sixty million people are pigeonholed as born criminals; they continue to be denounced by society and targeted by police despite their efforts to integrate peacefully into the mainstream. The Chhara community is one such DNT. They trace their origins to the Sansi tribe of Rajasthan who served in the army of the local king until the Mughals invaded and conquered. The surviving Sansis fled into the surrounding jungles and over time adapted a nomadic lifestyle, depending on various folk arts for their survival. After the Act of 1871, the Sansi people near Gujarat were placed into the open settlement of Ahmedabad and came to be known as the Chharas. After 1952, the Government of India resettled them on the outskirts of Ahmedabad, in a place called Chharanagar, which is roughly three square miles with an estimated population of over twenty thousand. People tried to assimilate with their surroundings, but their lack of employable skills and the general reproach towards them forced many into crime for survival. Some portion of the Chhara settlement turned to brewing hooch in the prohibition state of Gujarat. Ironically, the art of distilling country-liquor was imparted to them by British officials who used the brew for their personal supplies. Today, the police continue to target the Chharas as scapegoats for various crimes. Though a sizeable portion continue to illegally brew liquor, for those interested in leaving the trade, they are often coerced to continue by the police, who earn heavily from daily bribes. The youth are actively pursuing their education and an impressive number have become professional lawyers, doctors, engineers, journalists, activists and actors, but they still find it difficult to acquire and retain employment due to the burden of their name. In February 1998, Budhan Sabar (who belonged to the DNT Sabar tribe in West Bengal) was murdered in a police atrocity. His wife fought to prove that her husband was innocent and won the case. Mahaswheta Devy, who had supported the case, sent the story to Daxin, who created a script and directed Budhan, the first play of the Budhan Theatre. The play has been performed nearly 750 times and is even taught in acting schools around the world. The script has also been translated into Chinese. Leveraging the power of theatre and the natural talents of the Chhara people, Budhan Theater continues to write scripts and perform street and stage plays based on the real life stories of injustices committed against individuals of DNTs. The members have also taken international masterpieces, such as The Balcony and Accidental Death of an Anarchist and re-scripted them, infusing elements of the local ethos. They have performed more than 25 productions and continue to encourage the awakening of the Chharas by spreading awareness through society. Budhan Theatre does not ask for money in exchange for their performances. Instead they invite people to donate books. The library stocks a collection of 3000 books (1600 English, 700 Hindi and 700 Gujarati) and has had around 1300 members since its inception. Budhan Theatre comes under the umbrella of Bhasha Research and Publications and receives funding from Ford Foundation. 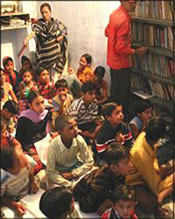 In the last fifteen years the Budhan community library has grown to encompass a daily non-formal education program, creative development projects, amateur and children’s theatre groups, a film making unit and Adhikar Abhiyan Kendra (a platform for DNTs to voice their needs for development to the government). They have also collaborated with IGNOU (Indira Gandhi National Open University) to offer a certificate course in Theatre Arts and a post-graduate diploma in Theatre, Journalism and Media Studies. The Budhan Theatre welcomes visitors and volunteers to their center, located off the main road of Chharanagar. The outer wall is stamped with colorful handprints, leading through an open courtyard and into a cozy adjoining room. Inside, volunteers and students converse in the local dialect, Bantu, but just as easily break into Gujarati or English. Classes, rehearsals, music, reading and discussions run in different corners of the room. Eight shelves of books stand scattered across the space. The center is run by an inspiring team of local youth, all of whom belong to the Chhara community. They are the teachers, mentors, librarians, coordinators and administrators. Budhan Theatre has also expanded their initiatives and guidance to other communities in Ahmedabad. Volunteers can get involved with any of the teaching and mentoring activities mentioned above or help out with rehearsals. Visitors can engage with the community, the center, understand the work and help spread the message of Budhan Theatre.